Spleen - Hyperplasia, Plasma cell in a female B6C3F1/N mouse from a chronic study. 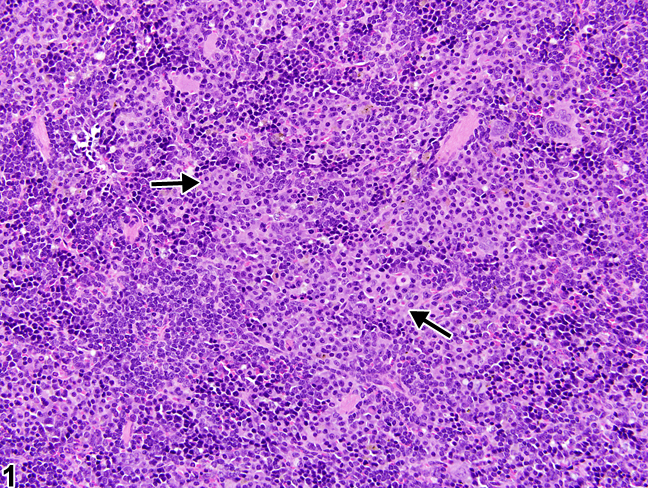 Small, multifocal aggregates of plasma cells (arrows) are present within the splenic red pulp. Spleen - Hyperplasia, Plasma cell in a female B6C3F1/N mouse from a chronic study (higher magnification of Figure 1). Plasma cells (arrow) are round to oval with a high nucleus-to-cytoplasm ratio, typically eccentric nucleus with heterochromatin in a characteristic cartwheel or clock face arrangement, and a pale perinuclear region with a Golgi apparatus. 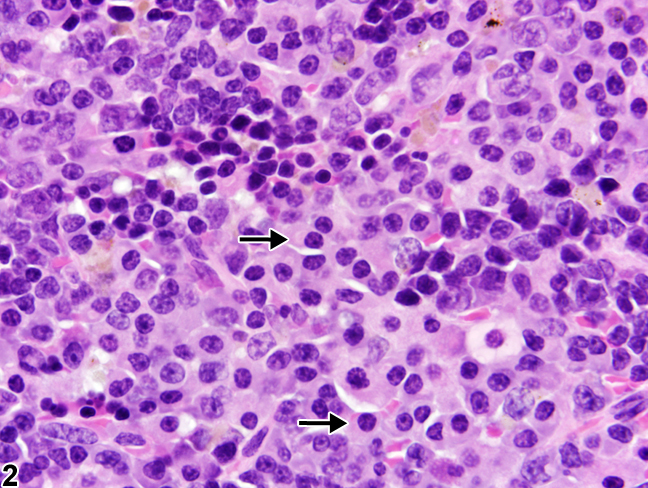 Plasma cell hyperplasia is a common, often mild, lesion in the spleen of rodents, particularly mice. It consists of plasma cells and/or plasmablasts that migrate to the red pulp from the white pulp (lymphoid follicles, germinal centers) following acute or chronic antigen-specific stimulation ( Figure 1 and Figure 2 , arrows), where they secrete large volumes of antibodies. Small foci of plasma cells that blend in with normal splenic cellular constituents frequently occur in spleens of aged rats and mice. If needed, plasma cells can be identified with immunohistochemistry for human kappa light chains or immunoglobulins. Plasma cell hyperplasia should be diagnosed when the number of plasma cells exceeds that seen in concurrent controls. When diagnosed, it should be graded. Cesta MF. 2006. 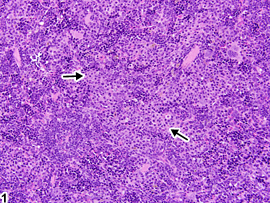 Normal structure, function, and histology of the spleen. Toxicol Pathol 34:455-465. Matsuno K, Ezaki T, Kotani M. 1989. Splenic outer periarterial lymphoid sheath (PALS): An immunoproliferative microenvironment constituted by antigen-laden marginal metallophils and ED2-positive macrophages in the rat. Cell Tissue Res 257:459-470. Mebius RE, Kraal G. 2005. Structure and function of the spleen. Nat Rev Immunol 5:606-616. National Toxicology Program. 1999. NTP TR-488. Toxicology and Carcinogenesis Studies of 60-Hz Magnetic Fields in F344/N Rats and B6C3F1 Mice (Whole-Body Exposure Studies). NTP, Research Triangle Park, NC. Van Rees EP, Sminia T, Dijkstra CD. 1996. Structure and development of the lymphoid organs. In: Pathobiology of the Aging Mouse (Mohr U, Dungworth DL, Capen CC, Carlton WW, Sundberg JP, Ward JM, eds). ILSI Press, Washington, DC, 173-187. Ward JM, Rehg JE, Morse HC III. 2012. 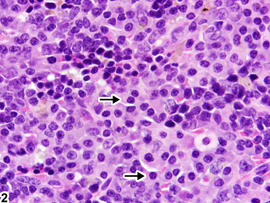 Differentiation of rodent immune and hematopoietic system reactive lesions from neoplasias. Toxicol Pathol 40:425-434.